I have not purchased anything pen-, ink- or notebook-related this week. I wrote about my Waterman Junior in this post. And good news about my Fountain Pen Revolution (FPR) pen: it arrived today! And no huge customs bill! I will probably write about it this Sunday. 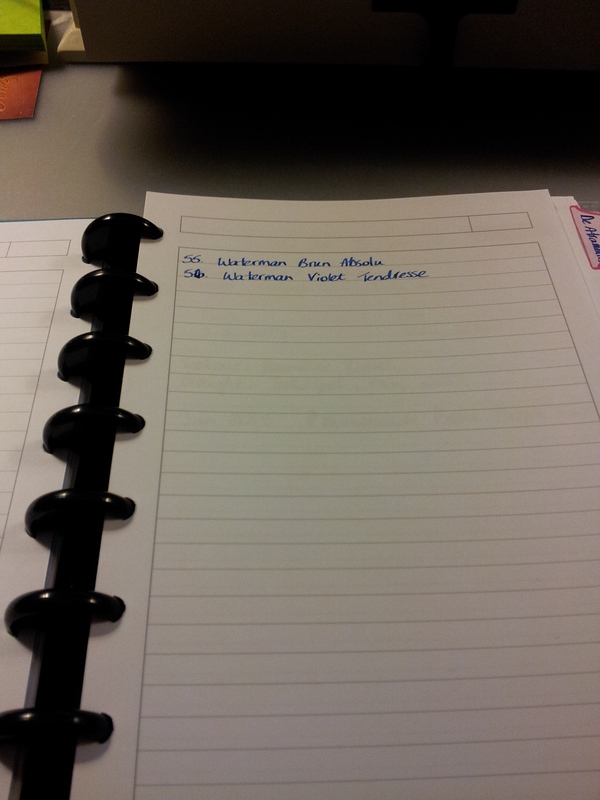 I was so excited when my Waterman arrived! I’ve linked the post above. Still loving it. I’ve been looking over my ink journal and I feel bad for those pens I do not use very much. So I’ve had a thought about how to change that and I think I’ve come up with a rotation system that I want to start in April. More on that next week. Of course there is so much more in the 27 pages written this week. There is a very stressful situation at work that I am involved in and I spent most of the weekend clarifying my thoughts in my journal. And that will probably continue for a while. Wish me luck! I’ve been writing letters for InCoWriMo and I’ve talked about my current pen and ink collection. 2014 seemed to be the year of buying. I’m hoping that 2015 will be the year of using. 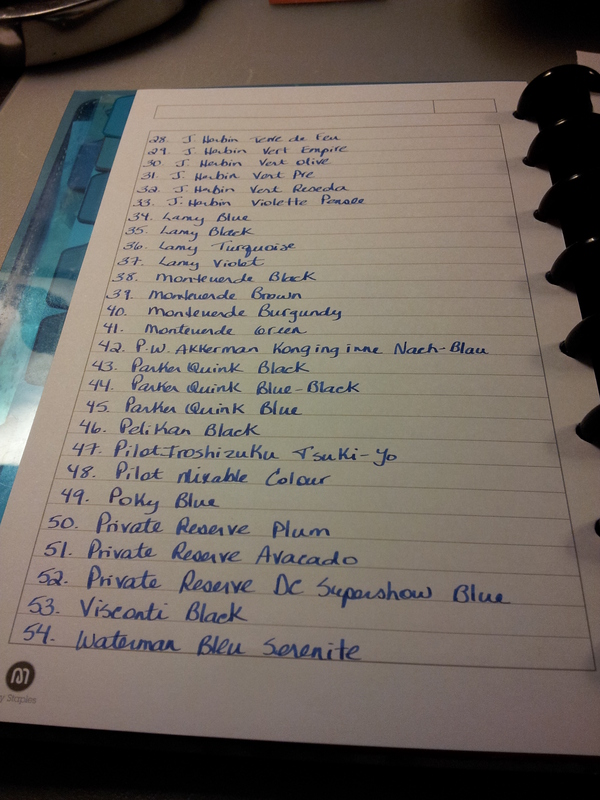 I wanted to take an inventory of my pens and inks. So I added numbered lists to my ink journal. It’s hard to believe my collection has grown to 31 pens! Have I reviewed them all? I will have to double check. 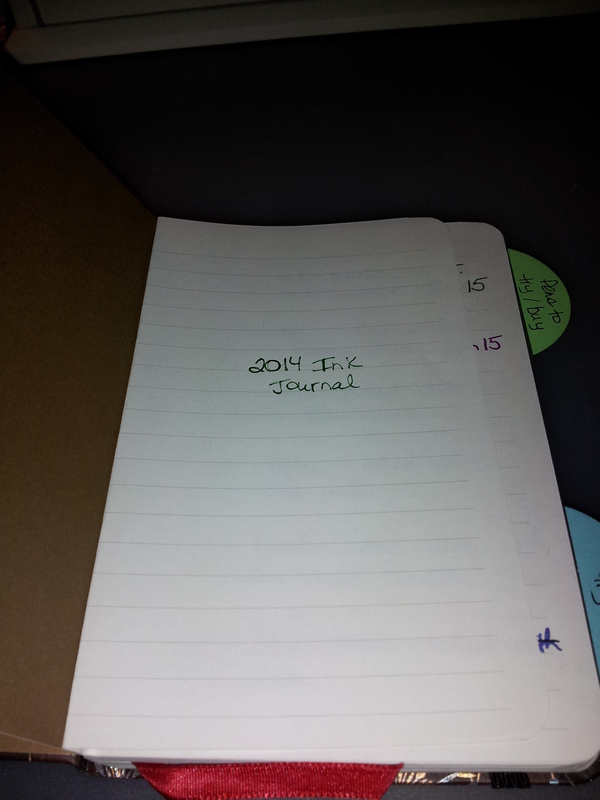 Another fact I can record in my ink journal: date of review on the blog. I also replaced the tabs; they were falling off in places and just didn’t look tidy. These ones look better. Not perfect because I have different-sized paper. But better than before. Now this doesn’t mean 56 bottles of ink; this list is both bottles and cartridges. Each company has its own page, and sometimes each colour has its own page, especially where I have done a large ink swatch. I like everything being organized; when a pen runs dry I can quickly find out what ink had been used. I’ve seen other ink journals that are organized by colour. The idea appeals to me, so that I would have all the reds together, all the greens, etc. When I was trying to determine which green I wanted in my Monteverde Prima Green Swirl I was flipping all over the place. So maybe I need another section…..cross-referenced colour lists. 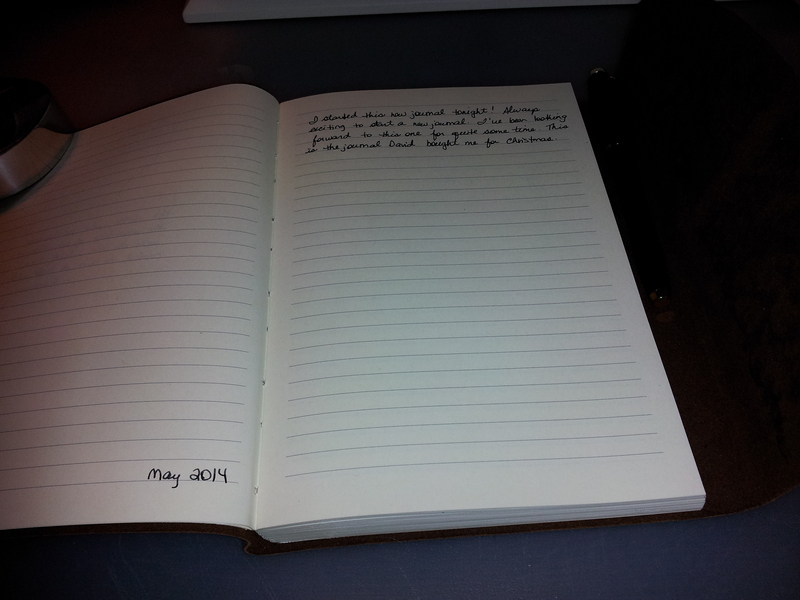 This ink journal will never be finished! I booked our flights and car for a little holiday my husband and I are talking in a couple of weeks. Now just to choose the hotel…..! Exciting. I have decided to quit my little dragon breeding game. It was beginning to take up a lot of time and I found I had less time for reading and writing, which of course only made me sad. So the game is gone. But that’s ok – more time for the important stuff! Recently I decided my Ink Journal just wasn’t working for me any more. It was disorganized and messy. 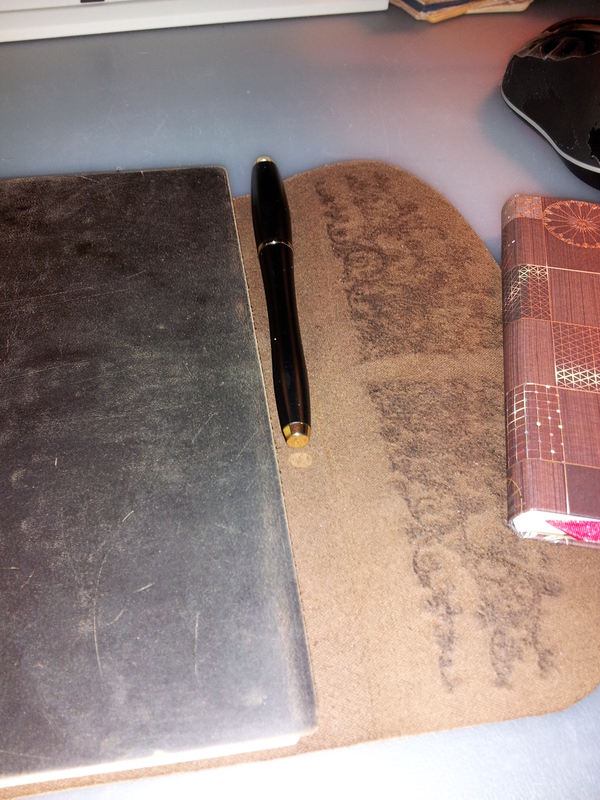 And I was missing my brown woven ARC notebook. So I combined the two. Here she is again. I’ve missed her! Missed this too. It’s an appropriate beginning to an ink journal, which will also contain all the details of my pens, both fountain and otherwise. 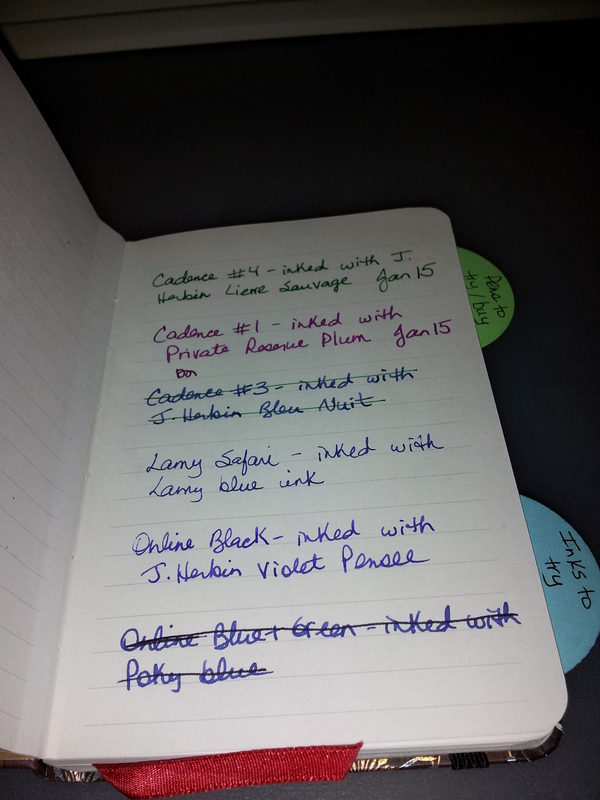 I had a bunch of colorful tabs that I wanted to use so each make of pen has its own page, as well as each ink company. Here is a typical entry for one of my pens. 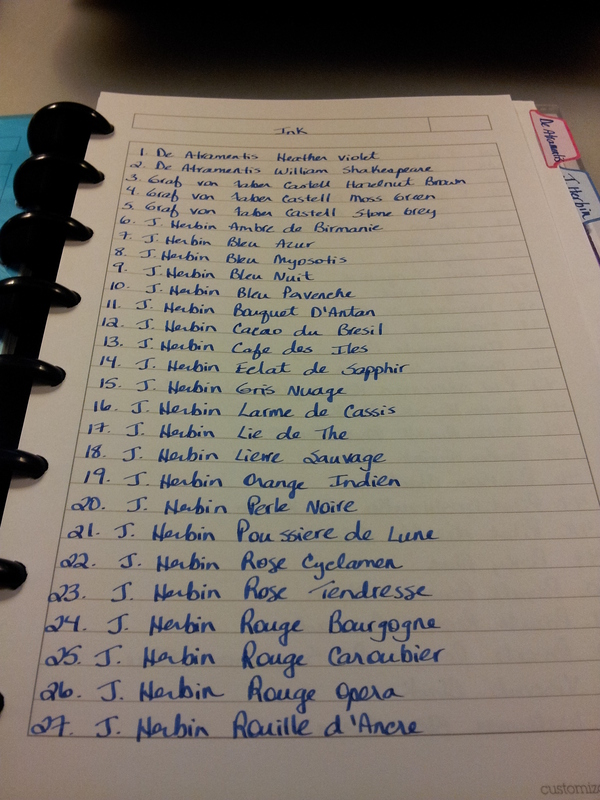 And here are the ink tabs. I like this system because I can keep everything in alphabetical order, unlike a bound book which was my former ink journal. Here is my entry for J. Herbin’s Lierre Sauvage, which I only have in cartridges, at the moment. Where I have a bottle I will indicate that at the top. Not all of the inks have this much detail. Today I cleaned out my Lamy Safari (which took FOREVER by the way; that nib holds a ton of ink) and inked it up with the new De Atramentis William Shakespeare. Love it! De Atramentis ink is hand-made; that’s why each bottle can be on backorder for so long, according to Goulet Pens. The labels too I expect. I was very amused to see the typo on this label! 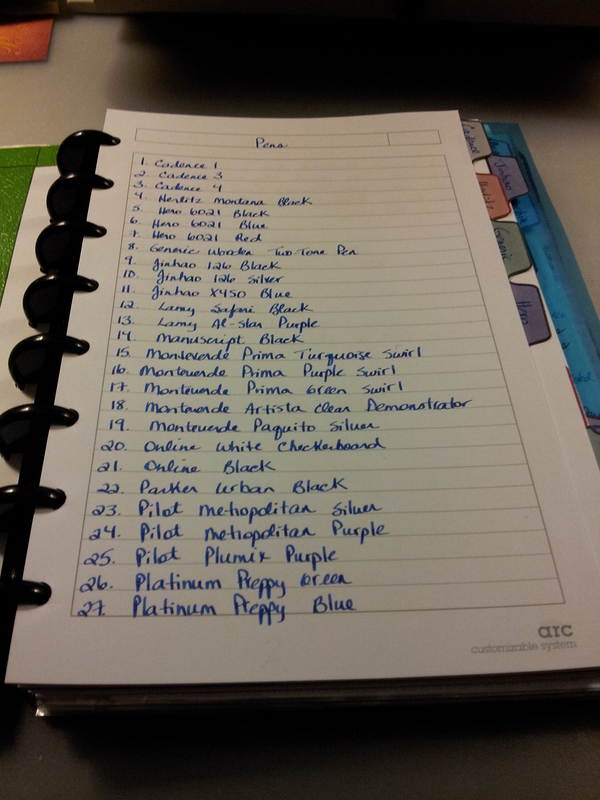 At the back of the book I keep track of my gel pen inventory, along with printed guides to some of the ink companies. Finally found a place to stick those Goulet Pens stickers. I cut the tops off the Slicci refills and paste them into the book. I do the same with the Coleto refills. So that’s about it for my new Ink Journal. I find it really handy when I want to write a letter or in my journal with a certain pen or a in a certain color; I can flip through this and find the combo I need. 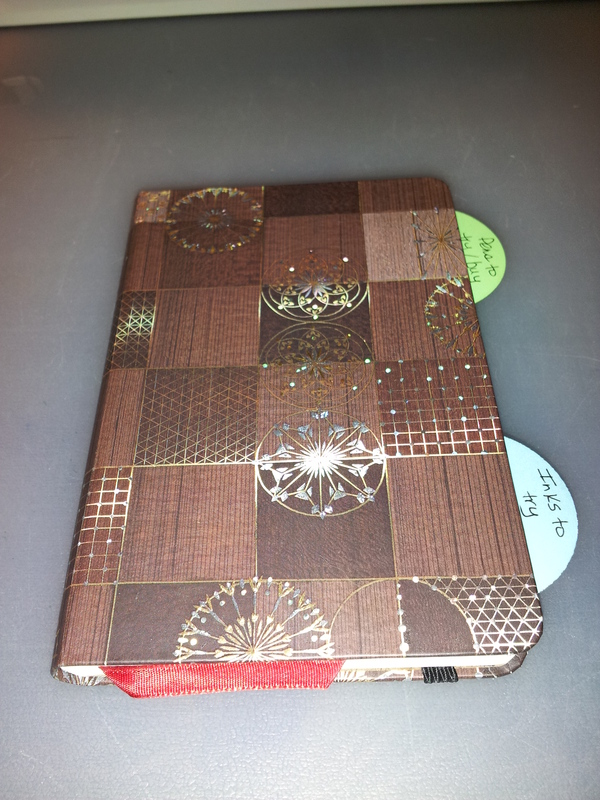 I’ve talked about the Paperblanks Ananda Mini before, in this post. I mentioned in passing that I was using it as an Ink Journal, and I thought tonight I would go into a bit more detail. The Ananda Mini cover. 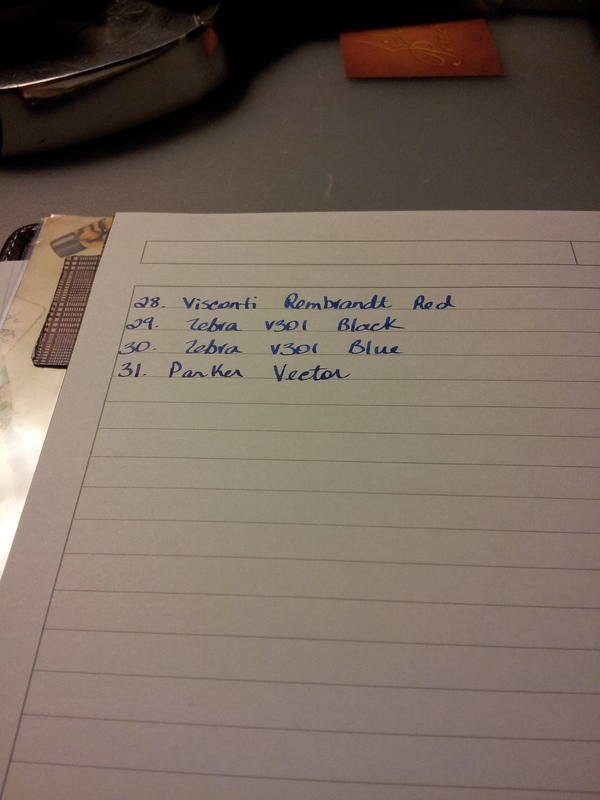 I’ve added tabs for inks I want to try and pens I want to try/buy. My first page. It will probably go beyond 2014. Currently I have 13 pens and I usually keep the same ink in the same pen so I doubt I will fill this up in just one year. As I change the ink I cross the entry off and add the new ink entry at the end. So that’s about it for the Ink Journal. Really handy, especially for my Cadence pens because they look exactly alike. Moving on to a bit of excitement: tonight I finished my Cross journal and officially moved into my Amarcord Embossed Italian Journal. Very exciting! You’ve seen this journal before, in this post. I had a comment on the original post asking how the paper handles fountain pen ink and so far, beautifully. 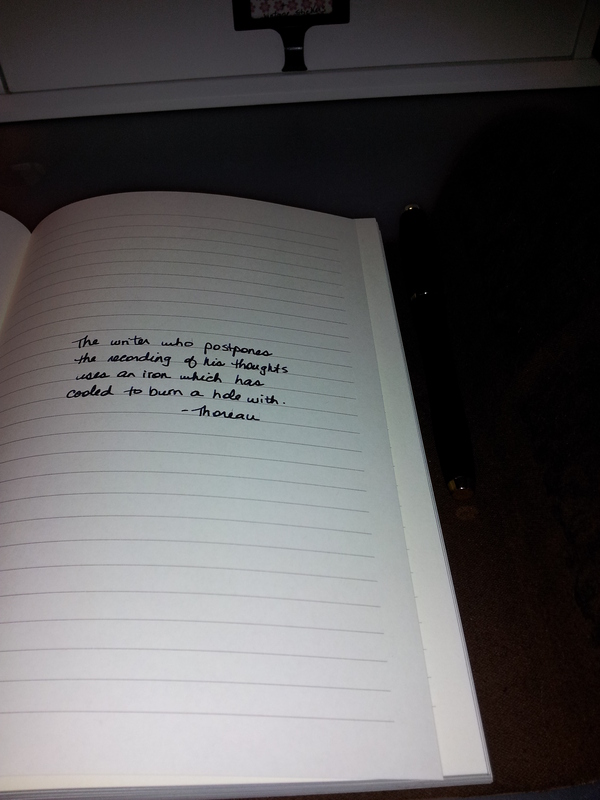 I like to start a new journal with a quote. This is not fountain pen ink, it is a rollerball. But I used fountain pen ink on the next page. I used my Parker Urban for this page and there is no bleed through or feathering. I think the paper will take fountain pen ink really well. I will do an ink test in greater detail on the last page of the book. I was worried about how I would attach my pen to the notebook, as it does not have a pen loop. 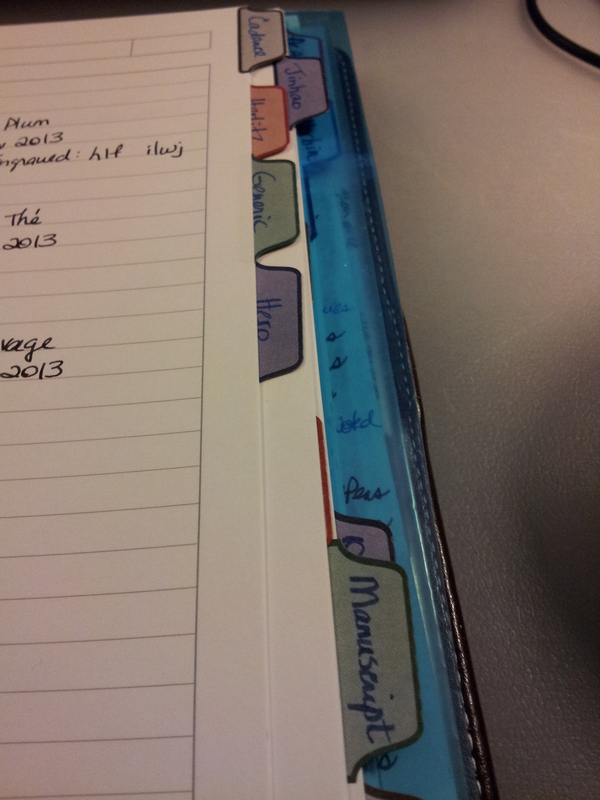 I have a spare Leuchtturm pen loop but I can’t use it again once the book is filled. My Parker Urban clips very nicely at the edge of the fold and when it is closed does not affect the pages at all. 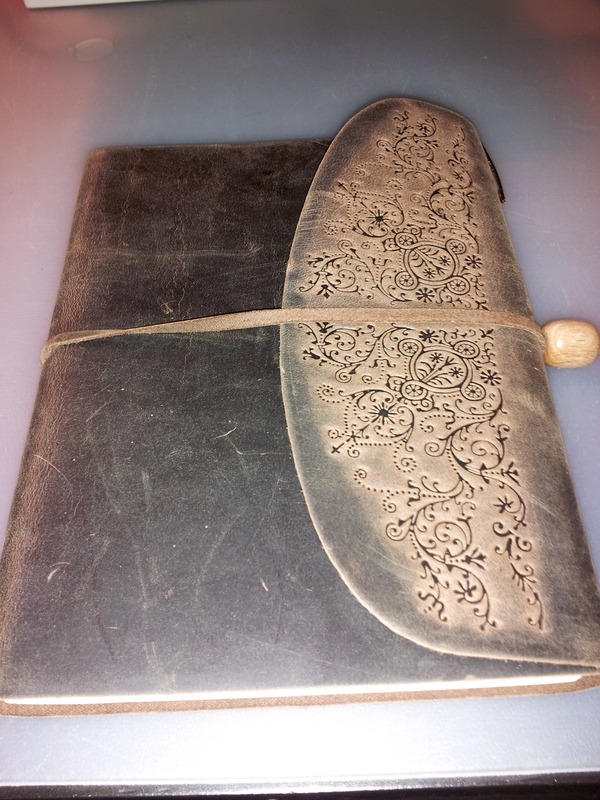 So now I’m off to bed and some more writing in my new journal.